Although workplace gift-giving should not be considered mandatory, many people and businesses do exchange gifts, especially during the holidays. That means every December when businesses honor the holiday gift-giving custom, people need to navigate the tricky gift-giving waters. Do you have to give a gift to your boss? The answer is no—gifts should flow downward, not upward. Another common dilemma is, how do you deal with that co-worker pressuring you to give more than you can afford to a holiday gift collection? Or, the big question each year, what gifts are appropriate for colleagues? Although each office has its own gift-giving rules (including only donating to the homeless or Toys for Tots). 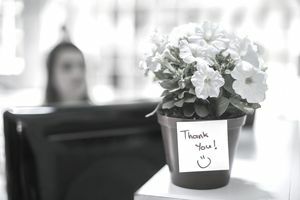 If your office is taking up a collection for a group gift for a colleague, you may feel uncomfortable about pitching in. Perhaps you're new to the office, or you're just financially strapped at the moment. If you're being pressured to chip in for a gift when you'd rather not, it's okay to say, "Sorry, but I need to pass" or "Sorry, my budget won't allow it this year." As a general rule, gifts that are intended to be put on the recipient's body (such as perfume, lotion, clothes, or jewelry) are too personal to give to colleagues. Gag gifts should also be avoided because they can be hit or miss, especially if you don't know the recipient that well. Wine and liquor are often appreciated—and have the benefit of being easily re-gifted if they're not to someone's taste—but be careful about giving alcohol to a recovering alcoholic, a Muslim, or someone else who is known not to drink. If you're participating in a gift exchange that includes a price limit (for example, "Gifts must be less than $20"), don't exceed it. If you show up with an e-reader or a cashmere blanket while everyone else is exchanging socks and funny mugs, you're likely to make other people feel uncomfortable. The reverse is also true. If everyone is exchanging gifts they genuinely hope people will enjoy, you're violating the spirit of the exchange if you show up with a gag gift and may cause someone to go home feeling slighted. Before selecting a gift, ask yourself what message the gift conveys about you. The right gift should show that you cared enough to give an appropriate and thoughtful gift out of appreciation and respect. It should not be something you picked up last minute at the gift shop downstairs. Giving extravagant gifts to get something in return or outshine co-workers is never a good idea. It does not make you look good and usually makes the recipient feel uncomfortable. Expensive gifts can seem out of proportion to the occasion, as well as to what other workers are giving. The message sent is not how generous you are but that you are a gift show-off. But "lazy" or cheap gifts send the message that you are only offering a gift because you felt that you had to. There are not many meaningful gifts that you can buy these days for $5, and a cheap gift usually appears cheap, insincere, and like a token gift. Every office is different. The best thing to do if you're in doubt is to ask a colleague or two how much they're spending. Generally, you should not give cash as a gift in the workplace. Giving cash is not considered acceptable unless it is given by the company as a bonus to employees. However, gift cards and gift certificates work just like cash and are acceptable. It's a good idea to do some research beforehand. You don't want to purchase a gift card to Starbucks if the person doesn't drink caffeine. An iTunes or Amazon gift card is always a sure bet. Giving no gift at all can be better than giving the wrong gift. If you're short on ideas, survey a few people in the company to get an idea of the kinds of gifts people are giving. You can also ask friends and family for ideas, or, search online for office gifts in the price range you want to spend. A good rule of thumb is to ask yourself how you would feel about receiving the particular gift you're contemplating giving.